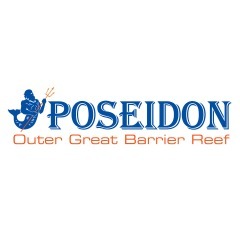 Poseidon first began operating outer barrier reef snorkel and dive cruises in 1980. 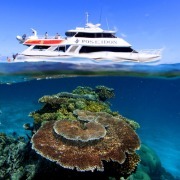 The journey continues as they have established a long reputation of providing visitors to the Port Douglas area with outstanding dive and snorkel experiences on the Great Barrier Reef. They have access to over 25 individual reef locations at the Agincourt ribbon reefs – one of the most spectacular and pristine patches of the entire Great Barrier Reef. Limited passenger numbers ensure personalised experiences for all visitors. Poseidon also holds one of only three permits in the area that allows passengers to swim with Dwarf Minke Whales. The opportunity to swim with the dwarf minke whales has to be one of the most amazing and privilaged experiences to have on the Great Barrier Reef. 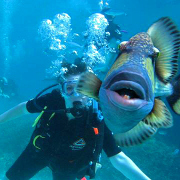 These curious and friendly creatures frequent the Agincourt reefs between the months of May and August. While these encounters can never be guaranteed sightings are usually common during winter months.